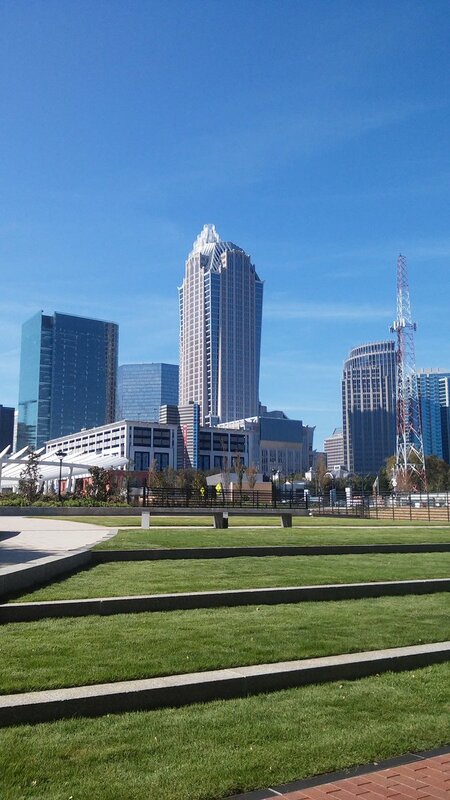 Downtown Charlotte, NC, on the morning of the UNC Charlotte-Kingston University London Critical Thinking Symposium, October 2016. I have been recently following the #edu16 Educause tweets, and the responses to the recent NMC report on digital literacy. The rhetoric coming from Educause (excepting the talk given by Chris Bourg, of course) and contained within the NMC report seemed very much the sort of thing I (not alone, of course) have argued against in the past–a model of teaching and learning and technology that focuses on problems to be solved, and solutions that can be purchased. I have been more fortunate, in the last month, to have had the opportunity to attend two different events that have challenged me in very different ways to think about the outside-of-academia forces that shape the ways we approach teaching, learning, and research. A persistent theme that emerged from all of the teams (more details on each challenge can be found here) was the need for collective action, for consolidated work that is accountable to many parties, for solutions generated from consortia and groups rather than handed to us by commercial products, and an underlying feeling that we must be in control of our own destiny, not swept along by the “solutions” being handed to us. A consistent worry was the pressures of assessment, of tenure and review processes, of accreditation that push scholars and their universities towards assuming that measuring scholarship, quantifying impact, are the right things to do to demonstrate value. These pressures come from political pressure, from skepticism about the worth of universities, increasingly framed with language such as “Return on Investment.” Our search for solutions was in part a reaction to these pressures, and attempt to take back the rhetoric around scholarship so that it is not reduced to an economic model of value, but that retains and expands our notion of worth to include human, collective, unquantifiable (dare I say qualitative) values. We as a room were pushing back against the quantified scholar, the transactional university, the techno-solutionism that reduces teaching, learning, and research to problems to be solved. And then I attended the UNC Charlotte-Kingston University London Critical Thinking Symposium, where we spent an earnest two days talking about, collectively defining, and thinking about the role that our teaching and learning practices do or don’t facilitate critical thinking, and how important it is to effective scholarship and citizenship. The 200 or so people attending the symposium were a mix of interested parties from across the Carolinas, from academic departments, assessment offices, centers for teaching and learning, libraries, administration, writing centers, and even some vendors. And in our conversations, it was clear that we were trying to revive and recenter the values of a liberal arts education, we were trying to both respond to and counter the “employability” narrative that reduces education to a professional qualification. The thing is, in that room, we were having earnest conversations about teaching and learning and citizenship and the crucial role critical thinking has to play. But outside of the room, the conversations around the buzz-phrase “critical thinking” aren’t coming from any of those concerns, but rather from a desire to control and constrain the academy, and universities in particular. All of these conversations are taking place in a larger context (#anthropology #drink) of suspicion of universities and the role they play. The call for “standardized tests for critical thinking” don’t actually come from a concern for that capacity, they come from a place of surveillance and suspicion. This is assessment as controlling process. There are so many tools and platforms to facilitate that paradigm of education, one overdetermined by quantification and technology. The collective critique by Audrey Watters of not just edtech but of the ways education is approached regardless of technology is instructive here. My fears are that “nextgen learning environments” will be amplifications of all that is problematic in current platforms and systems that take as their assumptions the closed, controlled, quantified, content-based education that many see in now-traditional VLE/CMSes. That the desire to control the academy will result in more reification of silos, more ways to measure, more attention to buckets of content. That the result will be to remove more people from the workflows of teaching and learning, and leave more work for the algorithms to do. My hopes are that this is an opportunity to de-center platforms, and to re-imagine teaching and learning around the values of scholarship that we discussed at length at TriangleSCI, and were earnestly trying to get at during the Critical Thinking Symposium. That is be a way to enact and make visible the networked human processes of scholarship. That it be a way to fight the reduction of academia to a factory for publications and “employable” students. A way to have more humanity, and more and more varied kinds of humans, participating in and producing scholarship. That this can be another chance for us to direct more of the conversations around teaching and learning and scholarship, rather than simply react to these persistent outside forces. Do you share the same hopes and fears? Do you have different ones? Then I will suggest you go tell him your thoughts – go tell Lawrie, and Jisc, what we need to be built, and what not to build, what is important, and what is a distraction. This entry was posted in Uncategorized and tagged #criticalthinkinguncc, #edu16, #learning, #teaching, #TriangleSCI, engagement, Jisc, technosolutionism on October 31, 2016 by dlanclos.